Looking back to 2011, I can’t say I would necessarily do anything differently. Still, a new year brings the opportunity to make changes or improvements and start new routines. I’ve never been one to make drastic moves when it comes to resolutions, especially since mine never stick – you won’t ever hear me declare I’m starting a new fad diet. In fact, my plan for 2012 is to do the exact opposite. Over the holidays I came to the realization that my life revolves around food; what I’m planning to make for dinner, where I’m spending my lunch break or which restaurant I choose for Sunday brunch, for example, are all decisions that I treat with great importance. Simply put, creating and eating great food makes me happy as a clam. In the New Year, my goal is to make the most of every meal whether it’s making an elaborate dinner for friends or eating my favorite dishes at some of Philadelphia’s best restaurants. Everything I make will be Clean Plate-worthy, and anything I eat this year will be worthwhile. 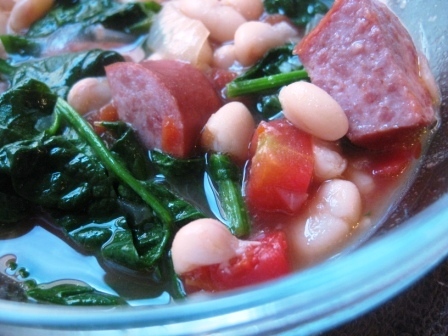 2012’s first dish in the East Berks kitchen was a filling kielbasa stew, thickened with white beans and laced with tomatoes and spinach. Every spoonful was purely perfect. 1 can of diced tomatoes, about 14 oz. 1 can of white beans, drained and rinsed, about 14 oz. In a large pot over medium heat, cook the kielbasa until browned. Add onion and garlic and sauté until translucent. Add tomatoes, white beans, broth and rosemary and bring to a boil. Lower heat and simmer for 45 minutes. Before serving, stir in fresh spinach until wilted. Some consider eating pork on New Year’s Day a tradition that will bring luck, wealth and prosperity in the coming year and what better way to prepare myself for the wonderful things the year will bring than with kielbasa. The meat brings a smoky, salty flavor intensified by the initial browning process. The white beans add substance to the recipe and thicken the mildly sweet combination of tomatoes and chicken broth. Fresh spinach wilts into the hot soup at the very end, contributing an earthy flavor and vibrant green splash of color. This soup satisfies a large appetite in a relatively healthy manner, with its well rounded list of flavorful ingredients. Easy to execute and utterly delicious, kielbasa and white bean soup was the perfect way to start the year off on the right foot. This recipe certainly set the tone for my resolution to limit myself to only the most delicious foods and, all superstitions aside, I feel luckier having eaten it. 2012 is going to be a great year for Clean Plate.